I once drove a school bus against oncoming traffic. I had a hard time steering due to all the drugs I had consumed, and cars exploded around me in rainbow-colored bursts. After maybe five minutes, I crashed into a truck and died. But the experience kept going. What happened next involved Big Ben, a space station and a squid-like creature made of baby mouths and hands. This wasn't just an isolated psychotic episode, either; I've relived it a number of times. And thanks to game designer Mark Essen, you too can endure this migraine-inducing odyssey by playing his surreal (and controversially titled) Randy Balma: Municipal Abortionist. Since 2002, Essen, aka messhof, has been designing games using Game Maker and MS Paint. These are some of the most basic programs you can use to create games, yet his work stands out as cutting edge even within the independent game scene. Other indie designers may sometimes use avant-garde techniques to try and confuse you, but none quite like Essen. His games rewrite the rules of game design; they turn the concepts of user-friendliness and reward structures on their heads. Playing them commonly results in extreme frustration, disorientation and nausea. They challenge players not just through their level of difficulty - which is high - but by how much visual and aural bombardment they're willing to endure. Where does he find inspiration? "Mostly friends," he says. "I'm lucky to have a lot of creative friends that actually make stuff all the time, so they're usually who I talk to if I'm trying to figure out what to do next." His games take ideas from classic '80s game design - simple, often side-scrolling 2-D graphics and basic combat or problem-solving challenges - and combine them with art-house sensibilities and more experimental design concepts. The easiest way to describe his oeuvre is through a case study of Punishment, a game he made for a class on the convergence of games and art that he made available online in 2005. It wasn't his first game, or even his first game that subverted the norms of game design - Bool probably has that distinction. However, it was his first game that featured his off-the-wall, disorienting, nauseating and bizarre techniques. Your goal is simple: Try to climb to the top of the screen while the game tries to confuse you. But this is easier said than done. 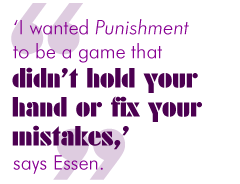 "I wanted Punishment to be a game that didn't hold your hand or fix your mistakes," says Essen. The game is extremely difficult, taking hours of play to beat, and you can't die no matter how far you fall. "Every time you miss a jump, you really miss it, and if you want to try again you have to climb back up. As you get higher up in the game, you have more to lose, since you can fall through as many screens as it takes you before you grab onto a platform," he explains. So, unlike a traditional platformer, there's no safety net in the form of lives, continues or checkpoints. But difficult jumps are hardly the only thing standing in your way. "I added some obstacles as you go higher that are supposed to be dizzying and nauseating. The screen rotates based on different factors in each screen, you can run into something that flips your right and left controls and each level has a weird background image that comes into focus as you get closer to the top."